Samsung Galaxy Indulge Smartphone : MetroPCS and Samsung Mobile introduced the world’s first 4GLTE enabled Android Smartphone, the Samsung Galaxy Indulge. At about half the cost of other 4G Smartphone service plans today, consumers can have it all with MetroPCS’ $50 and $60 4GLTE Smartphone service plans, which include all applicable taxes and regulatory fees. Metro PCS is delivering this unmatched value with unlimited talk, text and 4G LTE website browsing, along with data access to streaming audio, video and mobile gaming content, downloads and Android software applications. Powered by Google Android 2.2, the new Samsung Galaxy Indulge Smartphone is the perfect handset for those who want to manage every aspect of their lives from a Smartphone. MetroPCS’ 4G LTE service delivers lightning fast internet browsing and also allows customers to watch and listen to exclusive entertainment and multimedia content from their favourite shows through the Metro Studio application. With the Samsung Galaxy Indulge Smartphone you will have quick access to the Android Market that provides more than 100,000 Smartphone applications to consumers’ fingertips. “The new Samsung Galaxy Indulge integrates two of Samsung’s core product investments; the Android platform and bringing powerful and intuitive 4G Smartphones to the U.S. market,” said Omar Khan, Samsung Mobile. The Samsung Galaxy Indulge combination touchscreen and QWERTY keyboard means Galaxy Indulge consumers can send messages via e-mail, SMS or social media through whichever input method they choose. As soon as we receive a Samsung Galaxy Indulge test sample, we will publish a photo gallery with high resolution pictures, followed by an extensive Samsung Galaxy Indulge review. 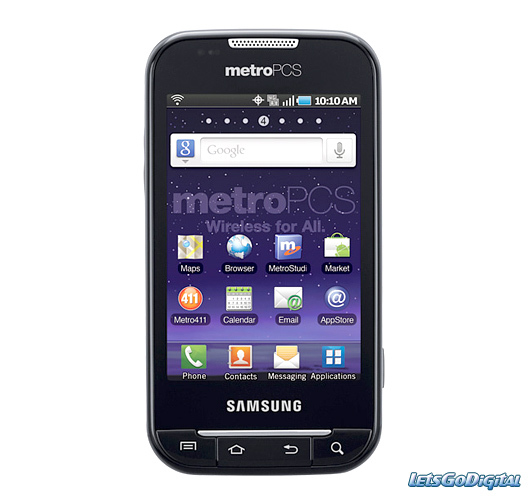 The new Samsung Galaxy Indulge Smartphone is the second LTE-enabled mobile phone offered by Metro PCS, following the Samsung Craft handset which was introduced in late 2010. The Samsung Galaxy Indulge Smartphone will be direct available in MetroPCS stores and online with a suggested retail price of $399 plus Tax.